Mega Sale! Save 28% on the Nocona Women's Snake Skin Belt, Black, White, M by Nocona Boots at Boot Bag. MPN: N3410062. Hurry! Limited time offer. Offer valid only while supplies last. This gorgeous women's Nocona belt features snake print leather, rhinestone and stud detail with a rhinestone covered removable buckle. Width 1 1/2''. 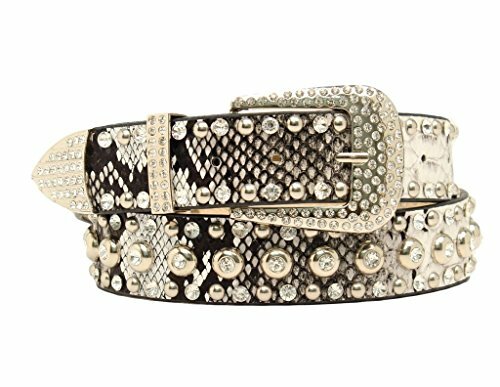 This gorgeous women's Nocona belt features snake print leather, rhinestone and stud detail with a rhinestone covered removable buckle. Width 1 1/2''. Material: Leather.